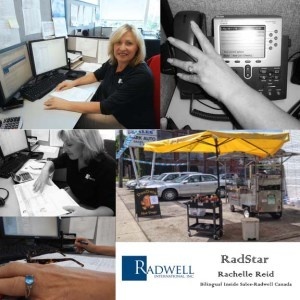 This week’s RadStar is Rachelle Reid who works as a Bi-lingual Inside Sales Person at Radwell-Canada. The fun part about my job is the Quebec customers. They always want to know where I learned to speak French. It’s a great intro with the French speaking customers. After college I would have gone to France and studied to be a pastry chef. I would love to make the perfect chocolate croissant. MMMM. If you could do anything or wish for anything to come true, what would you wish? This is the one thing dear to my heart. I would want to provide service dogs for as many children as possible (for those who could not afford to get them). Last summer my husband had purchased a hot dog cart. I was selling hot dogs and sausages and all the proceeds were donated towards a service dog for a child. We raised $ 6,000. (It costs $ 20,000 to train one service dog).